The AGH BMO World Film Festival, held each September in Hamilton, Ontario, celebrated its sixth year this past weekend. Beginning with last Friday’s screening of The Trip to Italy, 2014’s line-up of 30 movies continues until October 5, with a pair of closing screenings of 20,000 Days on Earth. Taking the reins from Annette Paiement, WFF director in years past, Ryan Ferguson faced a daunting task in putting together this year’s festival, as the Art Gallery of Hamilton’s new Manager of Film Programme. Ferguson took some time to speak to The Apple Box about this year’s challenges, what to expect from this year’s batch of films, and his personal favourites to watch out for. Chris Luckett: How is this year’s festival different to those of previous years? Ryan Ferguson: The differences are few, and most are so subtle they probably don’t need to be mentioned. We’ve continued and expanded last year’s focus on stimulating discussion by organizing panel discussions to follow several of our film screenings. That engagement is one of the fantastic opportunities a festival style screening offers. CL: What can people expect from this year’s batch of films? RF: Put simply, a great mix of award-winning festival features and documentaries from around the world. CL: What approach have you taken to organizing the WFF? 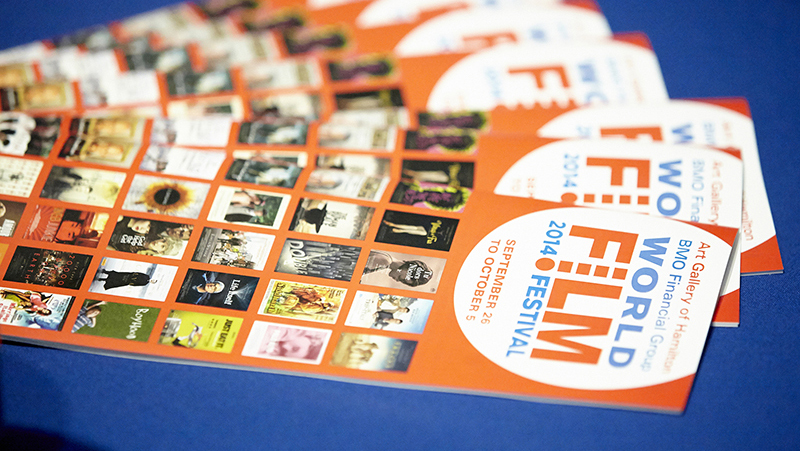 RF: My primary focus this year was to streamline the programming and message of the festival. We had an amazing 5th anniversary festival in 2013 and I wanted to focus the 2014 festival on the things we did the best last year. Ultimately, my vision of the film festival is about the films. Programming is always the first and top priority. CL: Have there been unforeseen challenges along the way? RF: Well, every project of this size presents many challenges, but overcoming those obstacles is worth every bit of effort when you hear a full house laughing in unison at the first joke in a film. As this is my first year programming a project of this size, there was a considerable learning curve related to the intricacies of film distribution and booking, but it was a great learning experience. I like to refer to it as my crash course in the film business. CL: This year, Mills Hardware has joined with Landmark Cinemas and SilverCity to provide a venue for screenings. How did they get involved with the WFF? RF: I’d previously worked with the Sonic Unyon team, who are operating the Mills Hardware venue. I was looking for a small venue with good sound and a nice projector and screen, to hold some of our smaller more niche screenings in. And Mills Hardware matched that description perfectly. CL: How did you decide which movies to screen this year? RF: We had a 10-member program advisory committee who met over two months in the spring and actually reviewed over 200 films to compile the list of 30 we’re presenting this year. CL: What was your biggest “get” of this year’s batch of films? RF: I think the biggest “gets” are the inclusion of two films that screened at both Cannes 2014 and TIFF 2014, Tu dors Nicole and Amour Fou. The best part about getting these films is that they’re both just fantastic. CL: What impact has TIFF had, with the WFF taking place just a few weeks after? RF: TIFF is such a large festival that the awareness it creates has really helped us grow the AGH BMO World Film Festival to the level it has. It can be difficult to secure certain films, due to the close proximity of the two festivals in both distance and dates. But, at this point in our festival’s development, the advantages definitely outweigh the disadvantages. CL: What are your hopes for the turnout this year? By what result will you feel this year’s fest will have been a success? RF: My hopes obviously are to grow the audience over last year’s turnout, but we’re screening fewer films this year, so equaling our turnout from last year should also be seen as a great success. CL: Lastly, I’ve got to ask: What’s your personal favourite of this year’s selections? RF: There are so many in the lineup that it truly is difficult to pick just one. I’m really looking forward to seeing Mood Indigo with an audience for the first time; I think it’ll be a great experience. Tu dors Nicole is so fresh in my memory that it’s my current personal favorite, but throughout this process, We are the Best, The Double, Tracks, Life Itself, Art and Craft, and probably a few others I’m forgetting have all been that favourite! The 2014 World Film Festival, presented by the Art Gallery of Hamilton and Bank of Montreal, runs until Sunday, October 5. For details on films, dates, and tickets, visit http://www.aghfilmfest.com.